September's UN-backed South Sudan peace agreement is holding and has led to positive change, but tens of thousands of civilians in the war-weary nation are still reliant of life-saving humanitarian assistance, and time is running out. This was the message that David Shearer, Special Representative of the UN Secretary-General for South Sudan, relayed to the Security Council on Friday. Mr Shearer outlined four notable changes in the country since the signing of the accord. 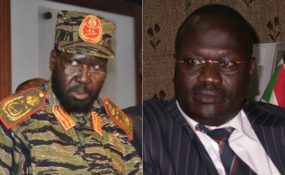 Firstly, opposition politicians are now moving freely around the capital, Juba, and taking part in negotiations to cement the fragile peace deal. The top envoy who also heads the UN Mission, UNMISS, also described a "palpable" enthusiasm for peace amongst the participants of around 70 different peace-related forums involving representatives of the Government and main opposition figures, many of which have been facilitated by the mission. The third positive outcome is a significant drop in political violence, meaning that "many people are alive today who might not have been without the agreement signed," said Mr. Shearer. Finally, he told Council members, South Sudanese are, for the first time, expressing a willingness to return home. Some 135,000 of the estimated 2.3 million refugees in the country have already made the move. David Shearer, Special Representative of the Secretary-General for South Sudan and Head of the UN Mission in South Sudan (UNMISS), briefs the Security Council. Mr. Shearer acknowledged, however, that the peace process faces several challenges. In Central Equatoria region, for example, forces that have not joined the peace process continue to fight government soldiers, with reports of lootings, civilian deaths and continuing sexual assaults. Ensuring that perpetrators of sexual violence are brought to justice is a vital part of the reconciliation, said Mr. Shearer, and UNMISS is working with the Government to build up the capacity of the justice system to deal with these crimes, operating a mobile court system by flying prosecutors and judges out to hotspots, and opening a new UN-supported special court to try crimes of sexual and gender-based violence, he noted. Maintaining the momentum of the peace process is another significant challenge, said the UN Special Representative, with the agreed timetable well behind schedule, and several fundamental issues still to be resolved. These include the definition of regional boundaries, the formation of a unified armed force, and the completion of a new constitution. Although South Sudan has seen relatively stability for some five months, the population is still facing high levels of food insecurity, and an absence of health and education services. Mr. Shearer pointed out that the aid received by South Sudan in 2018 - some $1 billion - is more than twice the country's state budget, a situation he described as unsustainable: "It is a reality that South Sudan's leaders often forget - or take for granted - that their country is supported by taxpayers around the world." The UN envoy added that UNMISS and other agencies are focusing on building up the resilience of communities in more stable regions of the country, in order to promote a shift away from reliance on aid. Mr. Shearer warned that there are just two months to go until a transitional government - which will include representatives of the main opposition - is scheduled to take office, and that a failed peace process could herald a return to violence: "The cost of failure is unthinkable. So, while responsibility lies primarily with the parties to the conflict, it also is beholden on us all to ensure that we move forward together to make this agreement a reality for the sake of the people of South Sudan."